Chartbeat CEO Tony Haile built his analytical service — originally part of New York’s Betaworks incubator, but later spun off as a separate entity — because he wanted to help publishers figure out which pieces of their content were working in terms of traffic and engagement. As more media sites have turned to native advertising as a way of generating much-needed revenue, Haile said he has seen the same need for analytical tools related to that kind of content, and so the company is launching a service called Paid Content to try and provide those tools. Instead of just looking at pageviews and other traffic-based measurements, Chartbeat’s tools show publishers how many visitors are reading a specific story at any given minute, how far they get through the content before leaving, whether they are returning visitors or brand-new readers, and other specific details that can help media companies track engaged customers. 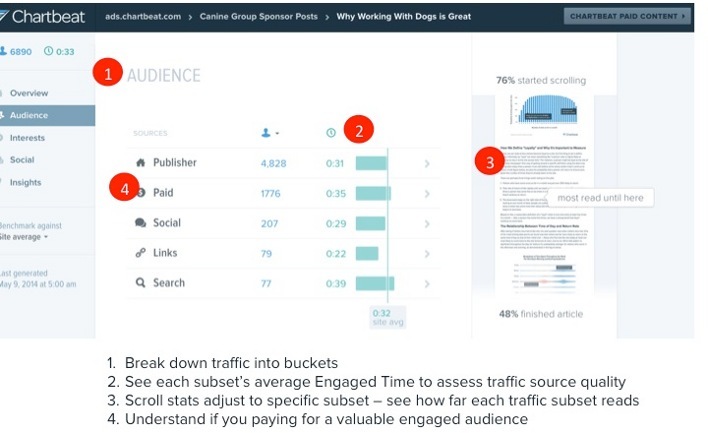 Its tools for paid content take those features a step further by adding more details about who those users are and what they are doing with the native advertising or sponsored content. 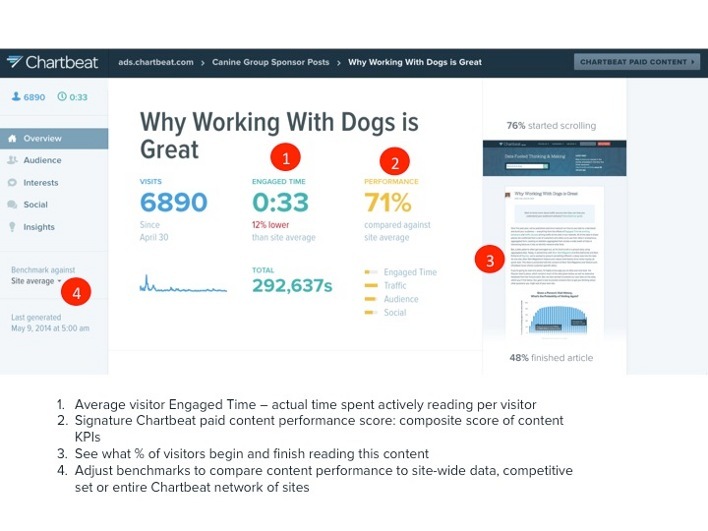 For example, the dashboard of analytics shows “average engaged time” for a particular piece of content — how long the average visitor spent reading, commenting, etc. — and then allows publishers to see how that compares to other pieces of their own content or to a group of competitors. And while Chartbeat’s regular tools show media sites in real time how far users have made it through a story or post, the Paid Content service shows how many readers in total started a piece of advertising, and how many made it to the end. Publishers and advertisers can also see statistics based on different categories of visitor — those who came in via paid channels (search advertising, etc. ), those who came in via social channels, and so on. Haile says that should help content creators compare the efficacy of those different methods of promotion, and benchmark their performance against either the whole Chartbeat universe or their competitors. Who are your most influential readers? Haile says Chartbeat can also show publishers and advertisers who the most influential of their readers and users are — based on their past engagement with the content, and how much traffic or other metrics they were responsible for generating — and whether any of them shared a specific piece of content on Twitter or some other platform. That could help content companies target specific users in order to increase the reach of their native advertising, he said. There are still many vociferous critics of the concept of native advertising or sponsored content, including blogger Andrew Sullivan — who believes that the entire concept demeans journalism — but more and more publishers seem to be turning to native ads for support. 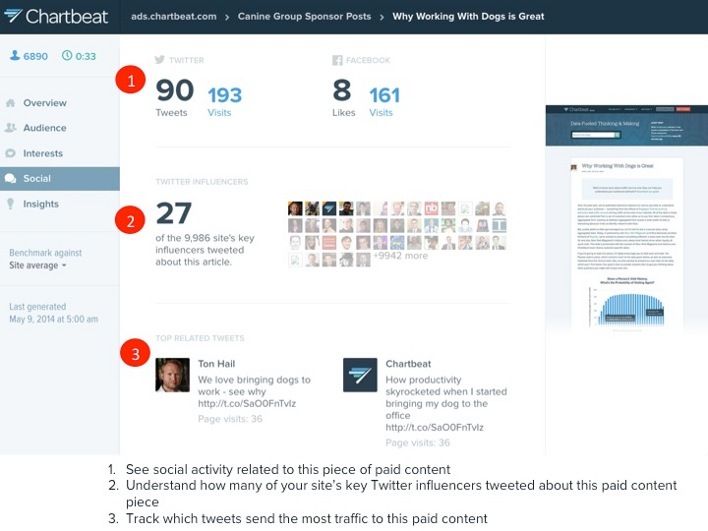 Can Chartbeat’s tools help make them better? That remains to be seen, but it seems like a step in the right direction. Haile said Chartbeat also recently got $3 million in funding from its existing investors — a group that includes Index Ventures and Draper Fisher Jurvetson — so that it could roll out the new features without having to go through the distraction of going to the market for a new venture-financing round. The company last raised money in 2012 with a $9.5-million Series B round.